For a species that feeds almost exclusively on the seeds of coniferous trees, it is not surprising that Crossbills were found mostly in the Forestry Commission plantations of Delamere and Macclesfield Forests, or that all of the habitat codes were coniferous or mixed woodland. They almost certainly nest in some of these areas but it is very difficult to confirm breeding and all nine tetrads with birds present are recorded just as possible breeding. The closest to proof of breeding came when Roger Wilkinson reported a family party, including one adult male and at least two birds of year, just south of Blakemere (SJ57K) on 9 April 2006, and I recorded a flock of twenty birds in the same tetrad on 14 May 2006. Richard Elphick saw two males and one young bird at Alderley Edge (SJ87T) in 2005. The lives of Crossbills are dictated by the seed crop: they eat little other than conifer seeds, spruce, pine and larch. They are capable of extracting seeds at any stage of ripeness, using their unique bill to prise apart the cones, but it takes extra time and effort on unripe cones and feeding is easiest when the cones are opening naturally, typically during winter and early spring in Scots and Corsican pines. When they are feeding in an area, Crossbills usually stay in the tops of the trees and are best detected by their ‘chup’ calls and by seeing flakes of cones drifting to the ground. The evidence is completed by finding cones on the ground, open and with the scales forced apart but intact, completely different from those taken by grey squirrels, on which only the inedible centre of the cone remains. Crossbills are so linked to conifer seeds that they are stimulated to nest by an abundance of food rather than the changes in daylength that induce breeding in most other birds. In European spruce forests they can breed from August to May on occasions, but in English pine plantations the season is shorter. Nests with eggs have been recorded in every month from December to June but mostly from February to April (Newton 1972). The timing of Atlas fieldwork does not fit well with the Crossbills’ life, and evidence of breeding is perhaps more likely to be obtained during winter surveying. After the two instances of proven breeding in 1981 described in our First Atlas (one of them not mapped, however), the records submitted to the annual county bird reports concentrate on influxes to the county and the only suggestion of breeding in the last quarter-century was in 1998 in Macclesfield Forest when a male was singing, a female seen carrying material into a nearby tree and the male feeding the female. 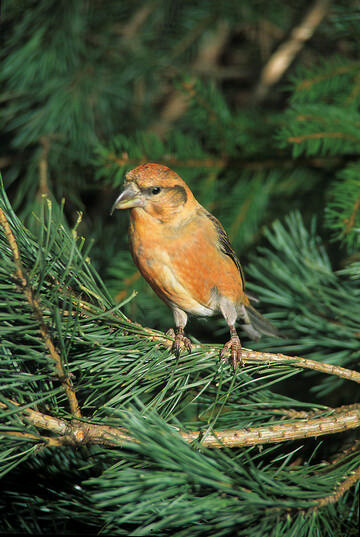 In 1999 Crossbills were ‘reported to have bred at Cholmondeley’ but with no more information. In other years, flocks including singing males and immatures were in Delamere Forest on 29 April 1989 and from March to May 1990; birds were said to be on territory or singing at Blakemere and The Cloud, Congleton (SJ96B) in 2000; and in 2003, juveniles were noted at Abbots Moss (SJ56Z) and Cholmondeley (SJ55F/ K), with family parties seen at Sound Common (SJ64J). Short of dedicated effort and sustained watching, always difficult with flocks of birds at the top of trees in dense woodland, this is as close as it gets to recording breeding in the county.